FoxPlan has great new features! « FoxPlan » collaborative project management software has improved thanks to a NEW MAJOR RELEASE! www.fox-plan.com. Allocate multiple resources to a single task. Get a detailed graph of project resource allocation in percentage of total resource capacity. Manage project budget within FoxPlan. Budget information will include: Budget, Assignment, Actual and Estimate to completion. Budget will be updated in real time as new assignments are added or resources record actuals in their timesheets. Resources input actuals weekly directly in their timesheets, and simultaneously update the estimate to completion of the task, thus providing project managers with an accurate view of what has been achieved and what remains to be done. Get an overall view of all your work in the new "My Work" screen. On that same screen for a given project or task, you can now add comments, update progress indicators or even set the status to "closed". Detailed calendars can be set for resources and projects. 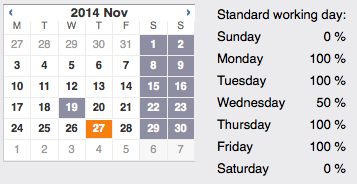 Calendars are now defined with availability percentage. For example, you may define half a day by setting 50% availability or 100% for the full capacity.